Convenient delivery conditions and well-organized management of shipping procedures are vital factors for operating a profitable ecommerce store. To those merchants who work with FedEx Shipping, we advise paying attention the FedEx Shipping Manager Magento 2 Extension by Infomodus. The module helps to automate various shipment procedures, quickly generate shipping labels, and simplify returns management. FedEx Shipping Manager offers web store owners a wide range of options allowing them to fine-tune the extension according to their business requirements and provide clients with improved shipping experience. Below, we provide an overview of the module’s core features and explore its backend and frontend functionality. FedEx is an international company that provides delivery services and covers more than 220 countries worldwide. FedEx Shipping manages a vast transportation network offering courier delivery by air, ocean, and ground. FedEx is well known as a pioneer in developing a comprehensive shipment tracking system with real-time updates on packages location. The carrier company is divided into a few operating units, including FedEx Express providing airline cargo delivery, FedEx Ground which is considered as a more cost-saving courier option, and FedEx Freight that offers shipments for freights of various sizes. FedEx provides its clients with flexible solutions for international shipping of packages and freight of any weight to meet specific business needs. FedEx also offers complex supply chain solutions for both small businesses and enterprises with various service options to satisfy customers around the globe. FedEx brings tools designed to optimize shipping options offered on an ecommerce site and streamline returns management. 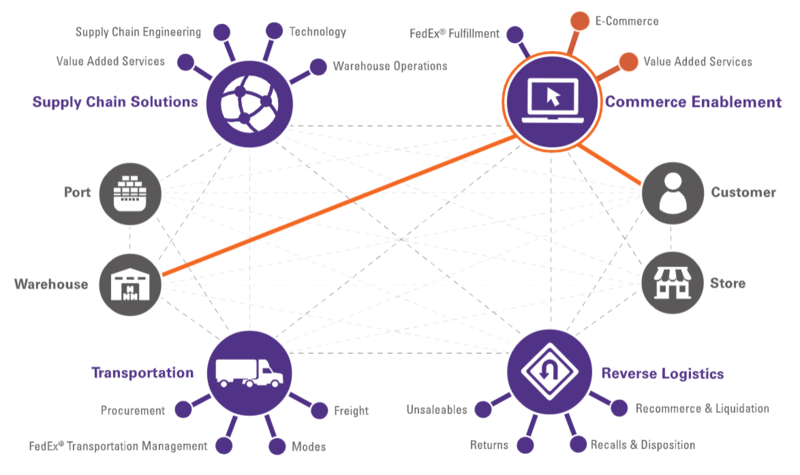 FedEx retail and supply chain solutions enable business owners to provide integrated customer experience and clear delivery and return procedures across various channels. The FedEx Shipping Manager extension is built to improve operational efficiency and order fulfillment of Magento 2 merchants that offer FedEx carrier services to their clients. Below, we provide an overview of the module’s features. Support for multi shipments and multi packages. With FedEx Shipping Manager for Magento 2, admin users can easily create FedEx shipping, return, and invert labels. Invert label is a variety of shipping label where a shipment is placed from customer to warehouse or shop, so that “ship from” and “ship to” addresses are interchanged. 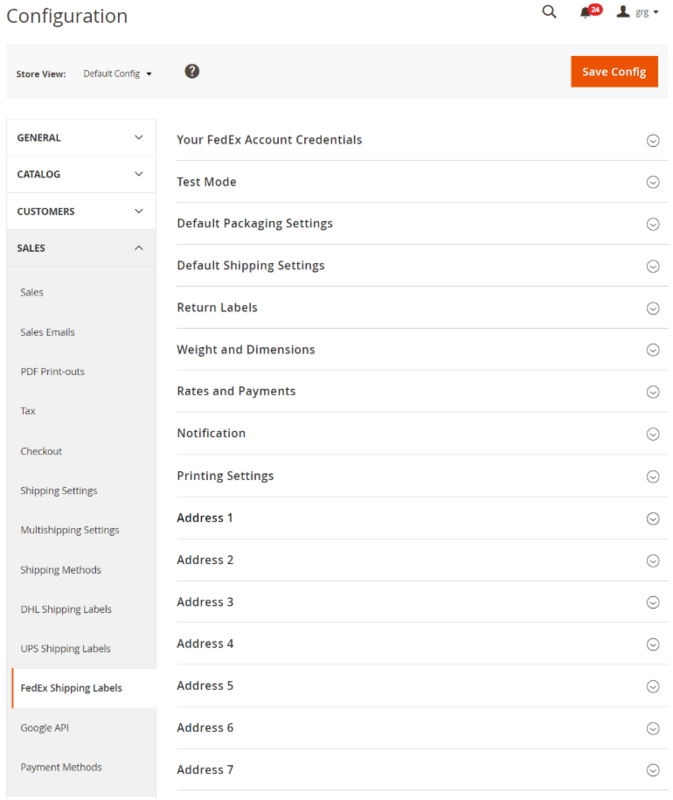 With the Magento 2 shipping manager module, you have several options for creating labels: in fully automatic, manual, or bulk mode. 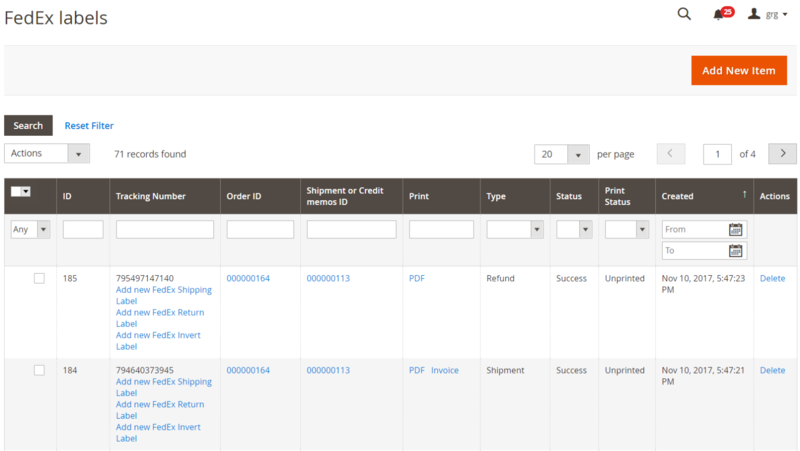 In automatic mode, a shipment and relevant labels are generated as soon as an order is placed based on the admin settings. If you opt for a manual mode, you will need to create shipment first and then generate shipping labels. It is also possible to manually select necessary orders on the appropriate grid and create labels for them in bulk. 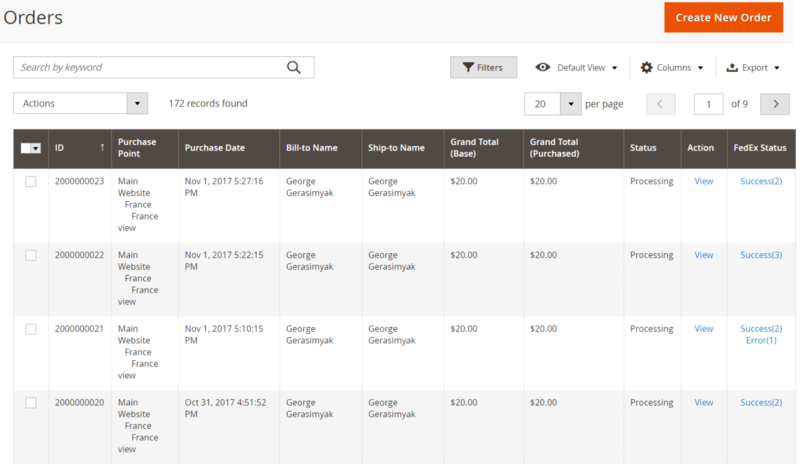 Note that you can generate test labels to check how everything works, as well as billable labels from the Magento Admin. 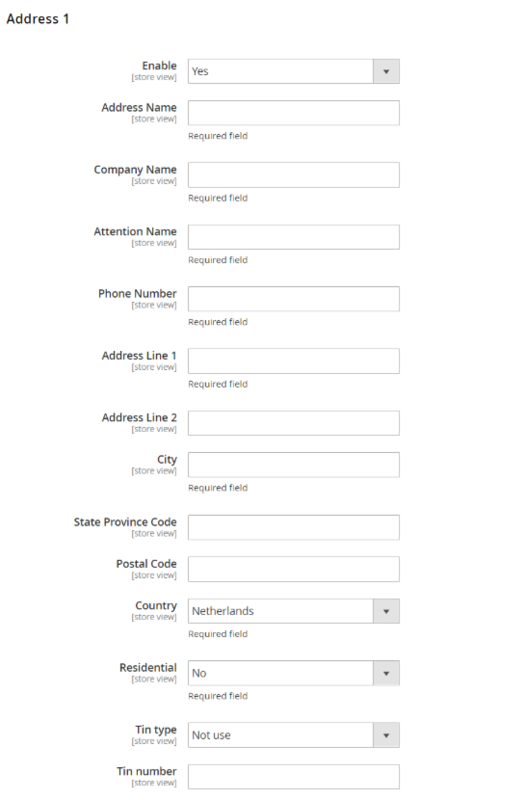 The Magento 2 FedEx Shipping module also simplifies return request creation by customers. Registered customers can generate and print return labels for completed orders in a few clicks from their account area. Moreover, the extension automatically sends a shipment tracking number to customers via email after a FedEx label is created. For more convenient management of shipping methods on your web store, you can create compliance of standard Magento shipping methods, like free shipping, flat rates, and others, and FedEx methods. Besides, FedEx Shipping Manager allows users to set various parameters as default, e.g., shipping methods for domestic and international shipments, drop-off point, currency, conditions for payment of duties and charges, cash on delivery payment option, and more. Moreover, you can decide who will pay for delivery, whether a shipper, recipient, or third-party company or person, and create an address book with shipper addresses. The FedEx shipping management extension lets you set weight and dimensions for shipments and create up to 10 packages with a fixed size. The module applies an algorithm to automatically calculate product packages and optimally distribute delivered items in boxes. 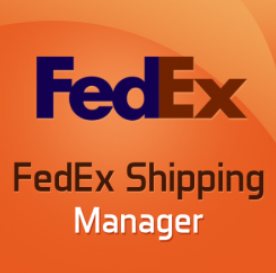 Using FedEx Shipping Manager, you can generate labels in PDF, ZPLII, or EPL2 formats and set their size. As for printing possibilities, you can use a thermal printer or laser printer. The Magento 2 module fully supports multiple stores management. 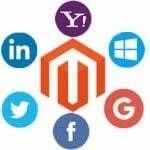 Thus, you are free to create a few accounts with FedEx and use them to configure settings in a different way for each store on one Magento installation. This functionality is especially beneficial for merchants operating stores in various regions or using multiple currencies. Note that you should create a FedEx account to obtain your own credentials for configuring the extension. After installing the module and registering your account with FedEx, navigate to the FedEx Shipping Labels configuration page in the Magento backend. The module’s configuration offers a big list of settings divided into a few tabs. The values specified in the fields are entered by default as the most frequently used and can be changed according to your needs. 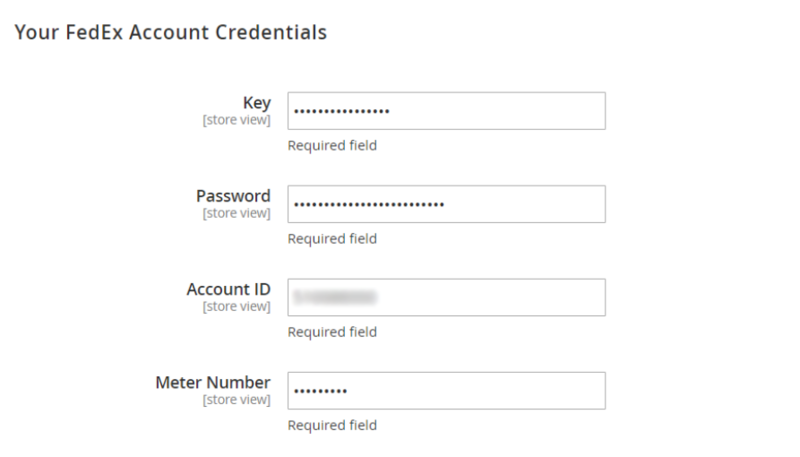 First, enter the credentials from your FedEx account: key, password, account ID, and meter number. Next, enable/disable the test mode depending on whether you want to generate test labels or billable labels. The latter can be used for shipping. 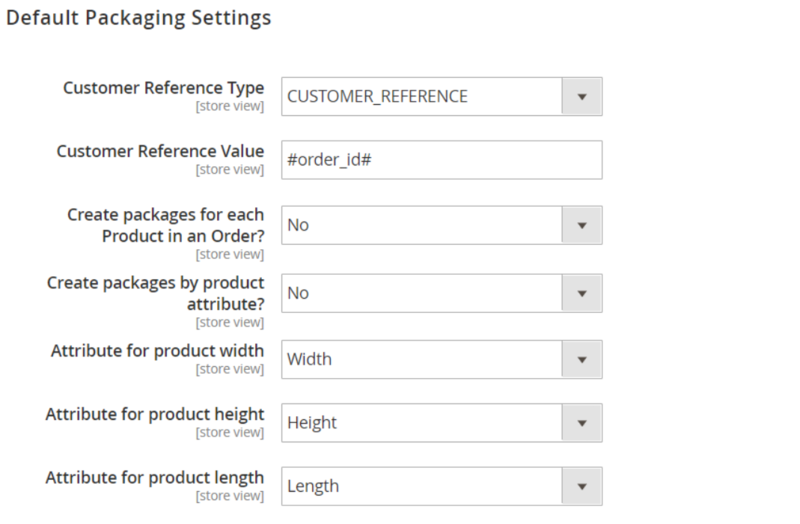 In Default Packaging Settings, you can select a customer reference type and value, activate package creation for each item in an order and by product attributes, as well as choose width, height, and length values for product packages. 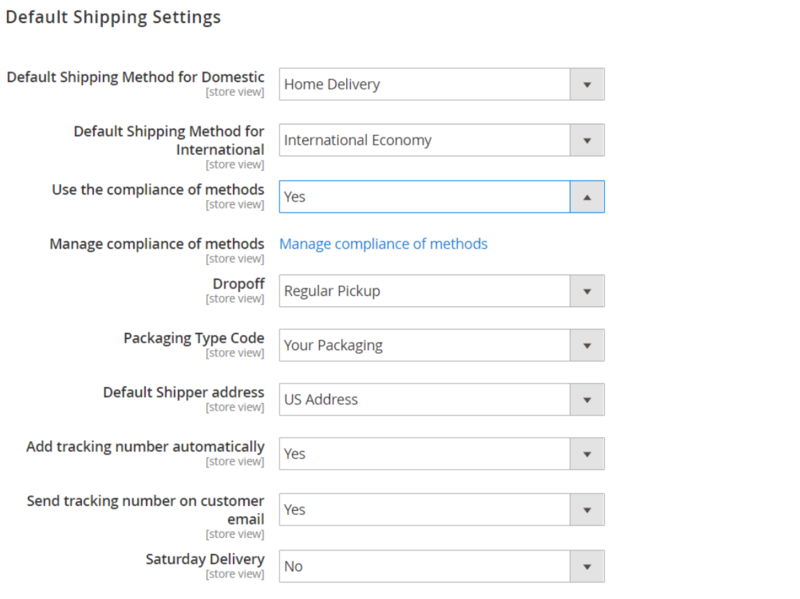 Then, configure Default Shipping Settings: shipping methods for domestic and international delivery, drop-off and packaging types, and shipper address. Here, you also decide whether to add a tracking number to shipping documents and include it in emails sent to customers automatically and enable/disable delivery on Saturdays. The extension also allows using the compliance of regular Magento shipping methods and FedEx shipping. To configure the settings of the relationship between different methods, click the “Manage compliance of methods” link. 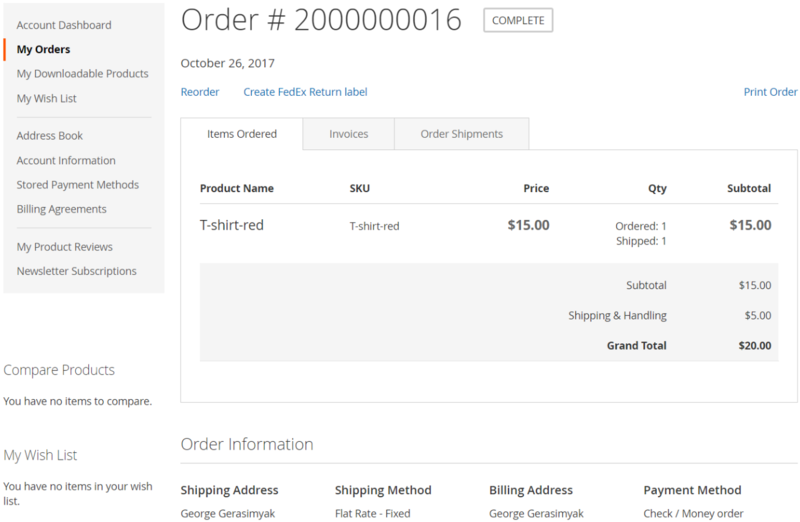 In Return Labels, you can allow customers to print return labels, enable refund functionality, and decide whether to create return labels at the same time when a shipping label is created. 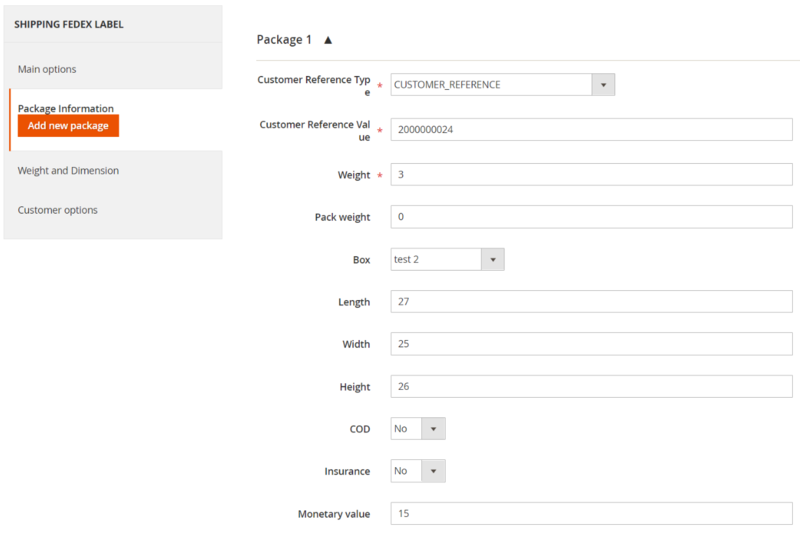 Here, you can also specify the minimum order value that will trigger the automatic creation of a return label. 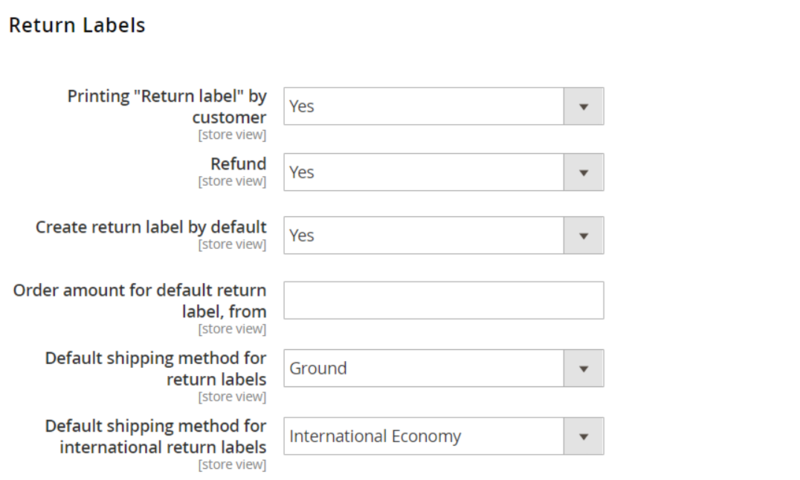 Then, select default shipping methods for return labels, including international ones. 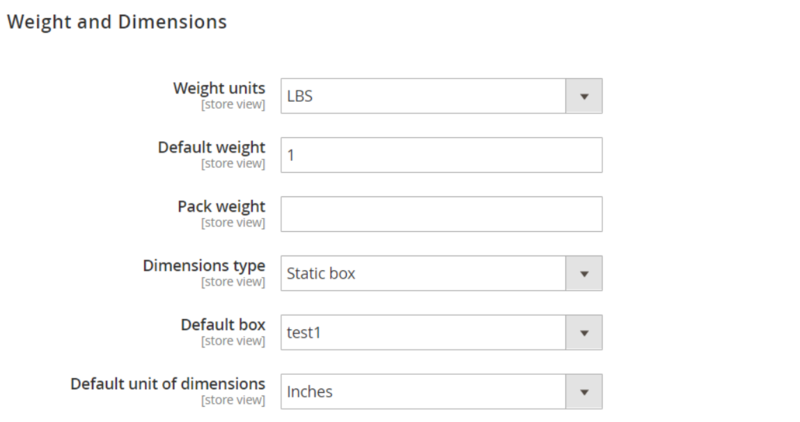 The next settings tab lets you choose weight (LBS or KGS) and dimension units (inches or centimeters), set default shipment and pack weight values, and select a dimension calculation method (static box from created options or automatic). In the following tab, you can set rates and payments options. 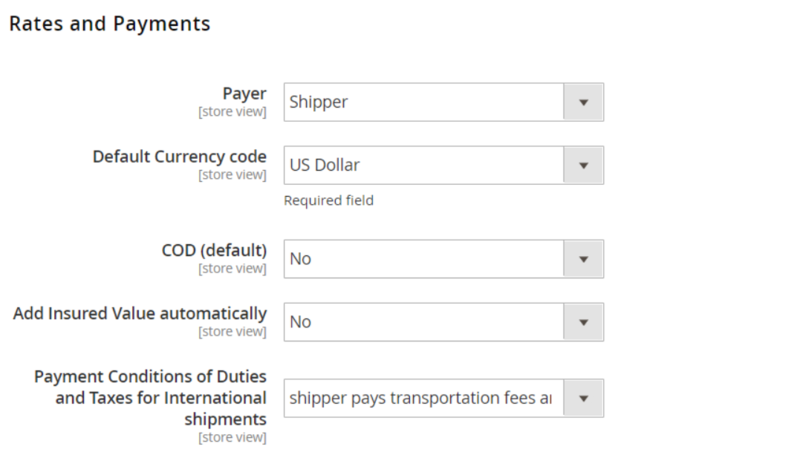 Here, you select who will pay for delivery (a shipper, recipient, or third party) and choose a default currency. Besides, you can enable accepting cash on delivery by default and adding insured value automatically. Also, define how transportation fees and duties and taxes will be paid: only by the shipper or divided between shipper and customer. 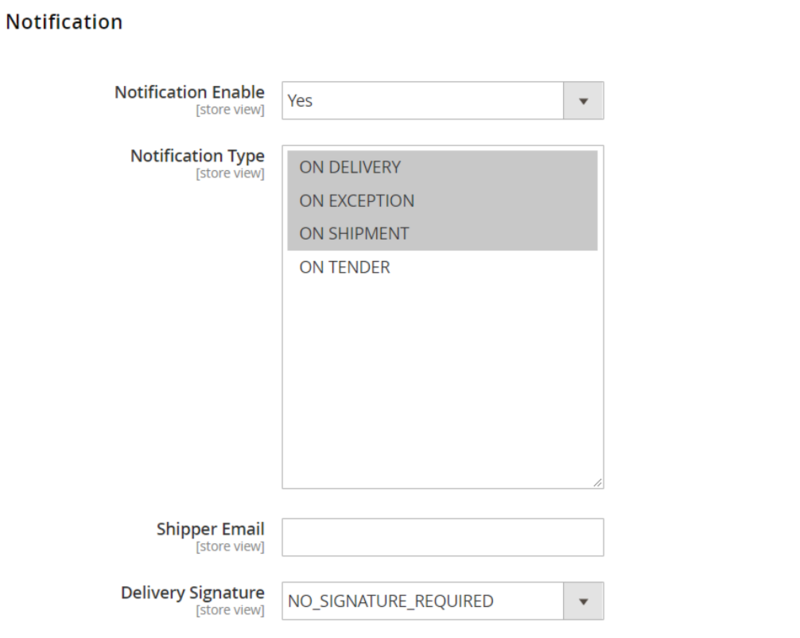 Next, you can enable notifications, select their types, specify a shipper’s email address, and choose a delivery signature. 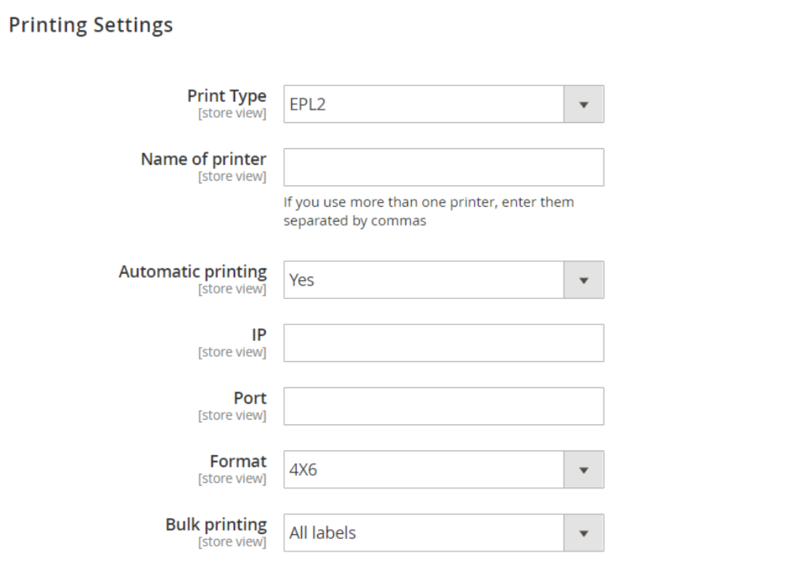 Printing settings differ depending on the Print Type you select: PDF, EPL2, or ZPL II. For PDF, choose a label format, decide whether all labels or only unprinted ones should be printed in bulk, and set the number of copies. EPL2 and ZPL II are the options for thermal printing. They have similar configuration settings: enter the name of your printer; enable/disable automatic printing and specify external IP and Port of the thermal printer; select a label format and a bulk mode option. 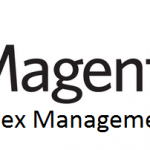 The extension allows Magento admins to create up to 10 shipper addresses. 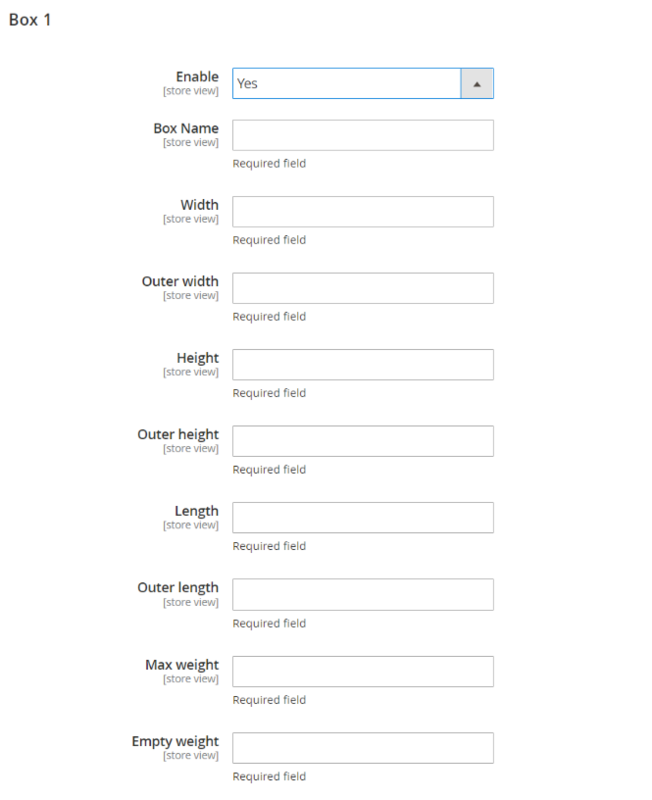 As for Dimensions, the FedEx Shipping Manager extension enables you to create up to 10 boxes of different dimensions that can be used later as packages for orders. 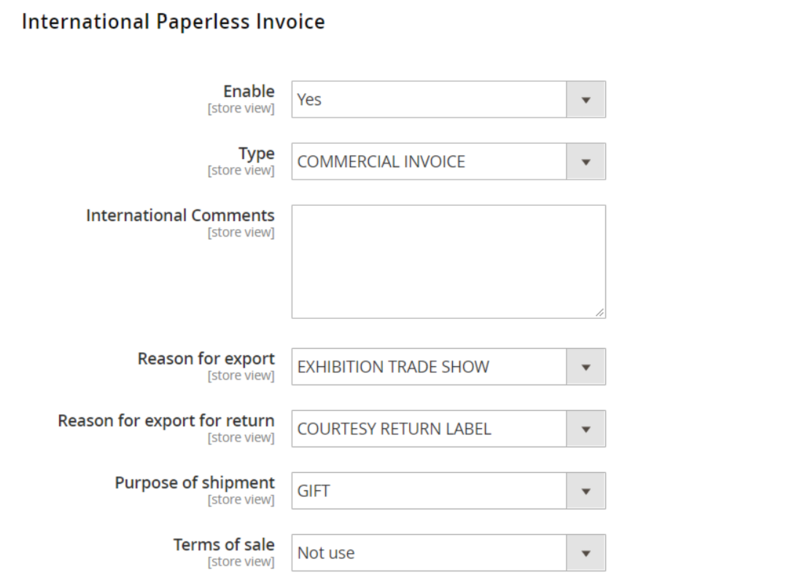 In International Paperless Invoice, you can enable electronic trade documents and select their type (commercial invoice or proforma invoice). You can add comments and choose reasons for export and return, the purpose of shipment, and terms of sale. Next, select a country of product origin, attributes for product description and harmonized code, and upload an image with signature. Moreover, the module’s functionality allows enabling the automatic generation of FedEx shipping labels on the order placement. 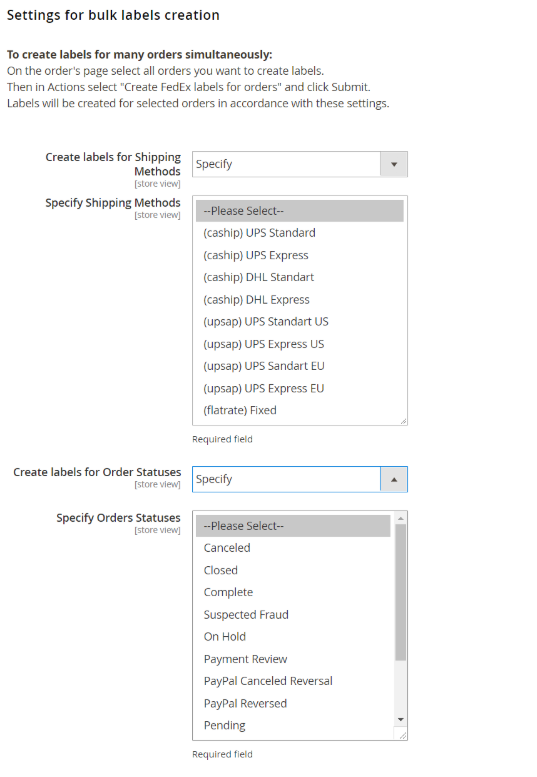 You can select shipping methods and order statuses from available options for which labels should be created. It is also possible to configure the settings for labels generation in bulk for all shipping methods and order statuses or only specified ones. On the Orders grid, you can see a shipping label status for each order in the FedEx Status column. It is possible to generate labels in bulk from here: select orders for which you want to create labels and pick “Create FedEx Shipping Labels” from the Actions drop-down. If labels are successfully generated, and order will receive a “Success” status. If labels generation fails, you will see “Error” in the FedEx Status column. You can check details of an issue with creating labels by clicking the Error link. Another mass action allows printing labels in bulk: select necessary orders on the grid and then click “Print FedEx Shipping labels” in the Actions drop-down list. If you want to generate labels for a specific order manually, open the order view page, click the “Create FedEx label” button, and select a type of label you want to create: Shipping FedEx label, RMA (return) FedEx label, or Invert FedEx label. 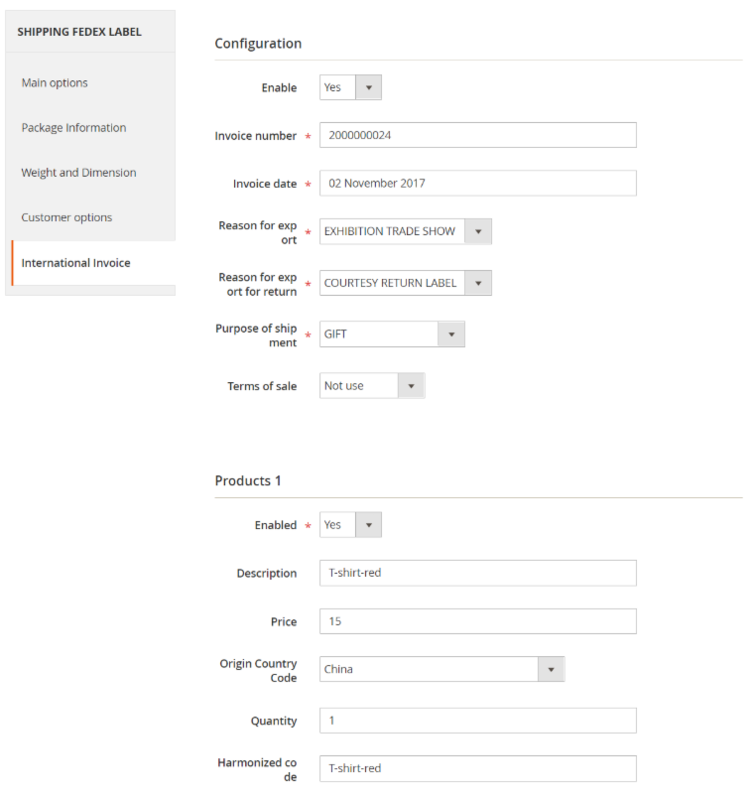 Then, you will need to configure settings of a new label in 5 tabs: Main Options, Package Information, Weight and Dimension, Customer Options, and International Invoice. Note that all fields here will be pre-filled according to the options you set in the general configuration of the module, but can be changed if necessary. 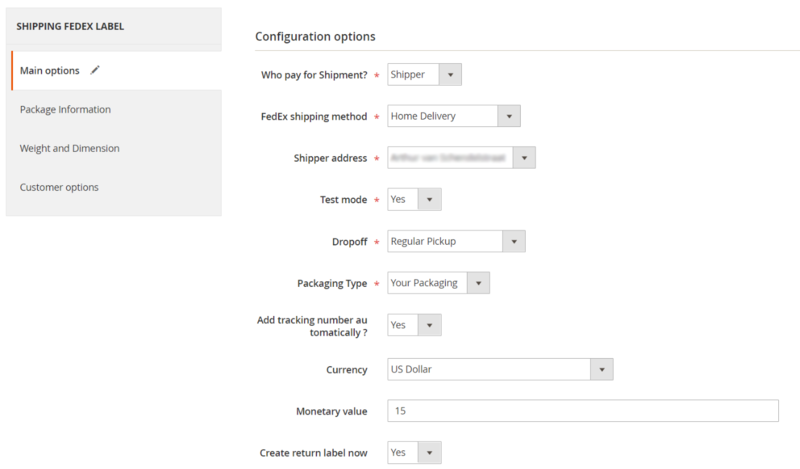 Besides, in Configuration options, you can see and change a shipping method chosen by a customer at the checkout, and check the monetary value of a shipment. As for the Package Information tab, here you can add as many packages as you need. In the next tab, you can change the weight and measurement units you set before. 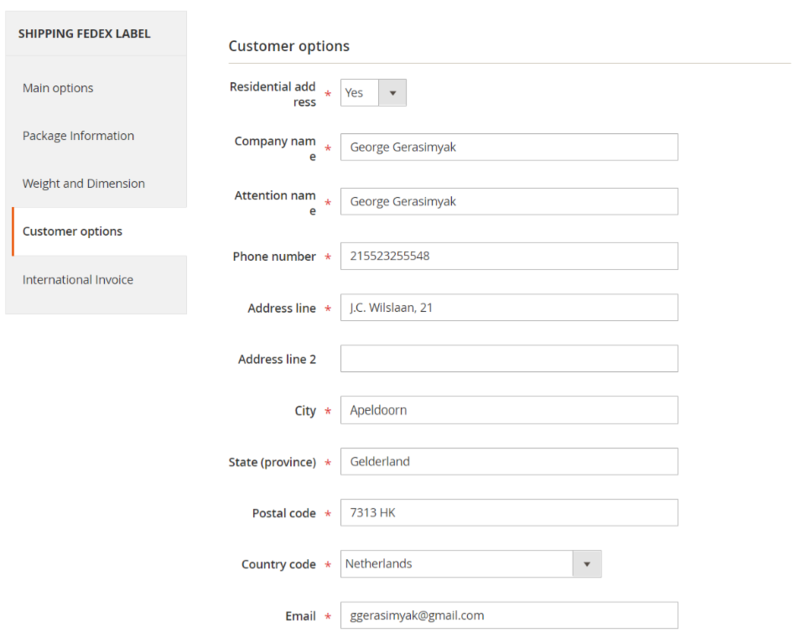 In Customer Options, you can define a shipping address as residential or commercial and view and modify a customer’s address details. 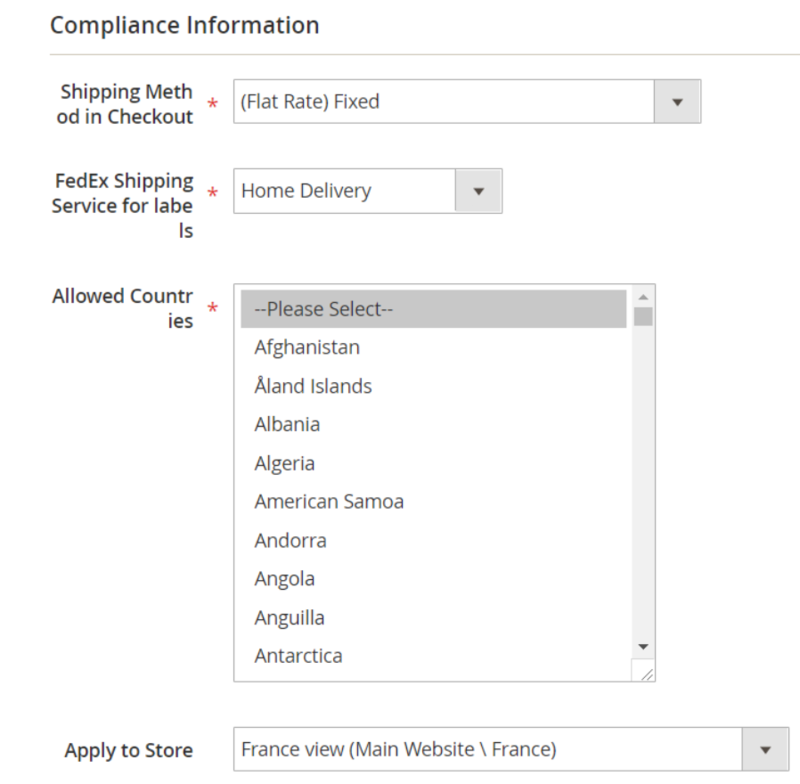 In the last section of the FedEx Shipping Label page, you can modify configuration options for international invoices as necessary. After configuring all settings and saving them, a new label will be generated, and you will be forwarded to a page where you can print the labels. It is also possible to print labels from the order view page, as well as the FedEx Labels grid. If you enable the “Printing Return label by customer” option in the backend, customers will be able to create and print return labels from their account area on your storefront. 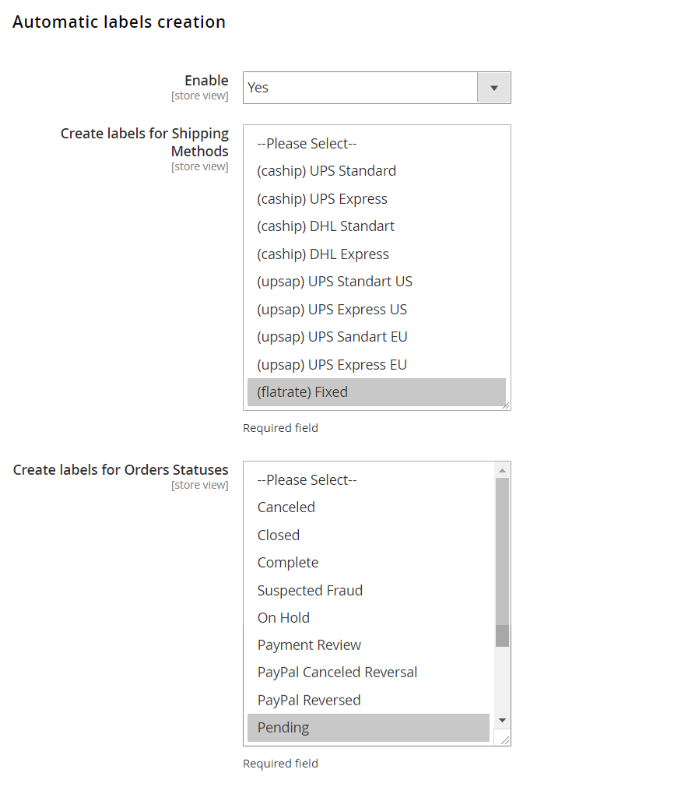 In the My Orders tab, the module adds “Create FedEx Return label” option to each completed order. 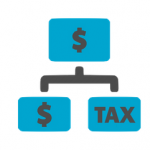 After clicking the link, a frontend user will be able to specify the number of items for refund, generate return labels, and print them. FedEx Shipping Manager for Magento 2 is an excellent solution for ecommerce merchants that use FedEx shipping methods for domestic and international shipments. With the module, store owners get necessary tools for organizing well-functioning FedEx shipping processes and save time on shipping labels creation and return management. As a result, you will provide your customers with more convenient order delivery, which directly affects user experience on your storefront. As for the price of the M2 module, you can buy it for $249.